Back in June when I attended the harbour front "Down Home" festival, I did a bit of shopping. They had a fair sized tent set up show-casing some maritime products. 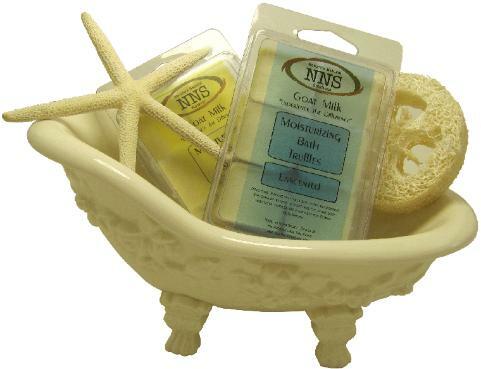 One of the purchases I made was some goats milk soap from a company called, "Nature's Natural Solutions". I really liked the soap for the bath and decided to have a look at their website to see what else they sold. I have what I call "fussy skin", it's on the sensitive side, but I'm in my mid-forties now, so am also interested in keeping my skin young looking. I had been looking for a new moisturizer for a while, as the one I was using was ok, but felt it was far too expensive. After reading some reviews of their facial products and exchanging a few emails with the owner I placed an order. Now I also use their facial cleanser, and have really noticed the difference in my skin the last couple months. My skin is more even toned, smoother and softer. The facial cleanser removes makeup just as good as the product I had been using before but at more then half the price. I use many of their other products as well and just adore their lip balm, my favorite is the "Nova Scotia Wild Blueberry". I live in Toronto where I could get any facial products I want and spend various amounts of money on each. Using Nature's Natural Solutions products is using a high end product without the high end price tag. I am really glad I decided to pick up that bar of soap back in June, and I love having something in my house that says "Made in Nova Scotia".